Torrents are the most common thing computer users hear of. There are torrent downloading, torrent sharing and many others. Torrent has become a business in the WWW. Due to the increase in demand of torrents, there should be torrent clients that downloads the files of a torrent. The most popular of them is uTorrent – A Windows package. uTorrent is widely used by computer enthusiasts. uTorrent is widely used because of it’s lightness, simple usage and limitless options. But, you have to install uTorrentto use it’s features. What if, your friend needs a download from torrent and he doesn’t have a torrent client. He don’t know how to install a torrent client. In this case, the only way is to use a Portable Torrent Client. Since uTorrent is light weight and easy to use, it’s the best torrent client to give to anyone. In this post I will tell you how to make a uTorrent software package portable. First of all download uTorrent from www.utorrent.com. The downloaded file’s name is utorrent.exe. Move the file to an empty location (folder). Create a file named settings.dat on the location where utorrent.exe is located. Some files and folders will be created in the directory where utorrent.exe is located. 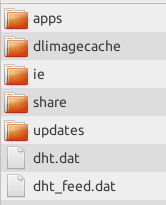 The folder where all of these files with utorrent.exe is the Portable uTorrent. You can give this folder to your friends and others and they can use uTorrent without installing.